EmEditor has been mentioned and discussed in the forum but it seems that there are users who do not know that EmEditor has a free version - EmEditor Free, which is very limited. 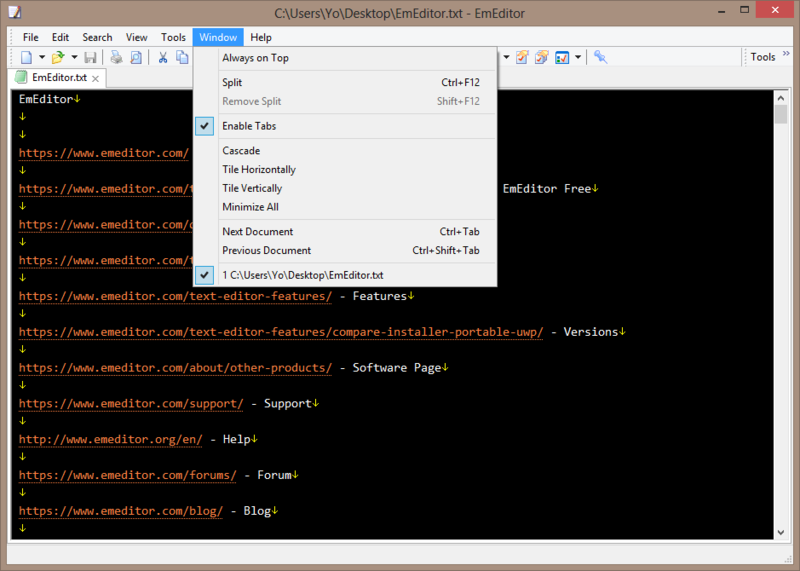 If you need a best free text editor, EmEditor Free might be right for you. 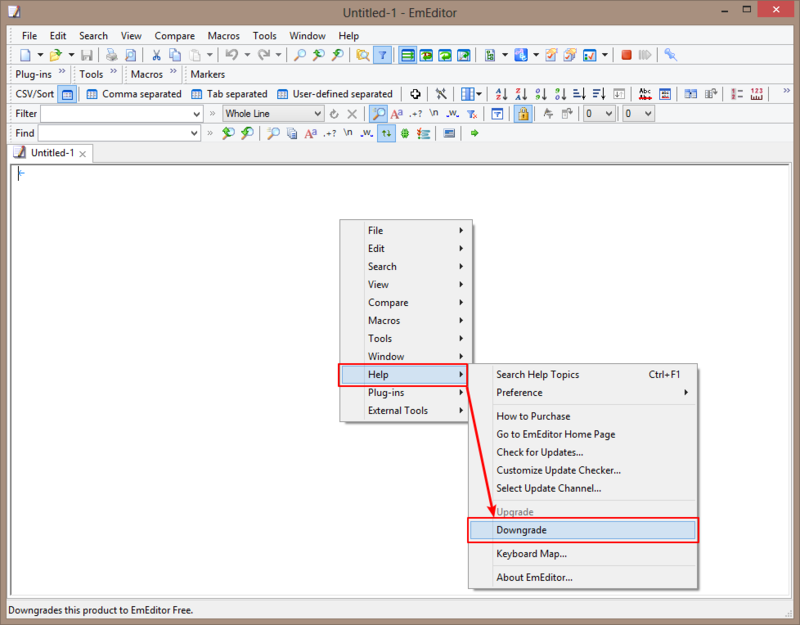 While not at the same level of EmEditor Professional, EmEditor Free allows you to do most of text editing tasks without purchasing the product. 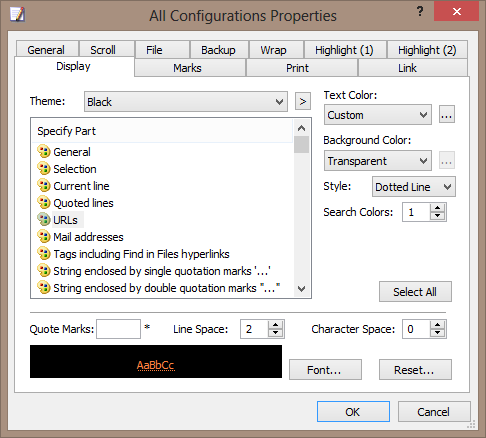 You can use it as Notepad-replacement with enhanced features like syntax-colored highlighting, find and replace function, Unicode support, and printing capabilities. 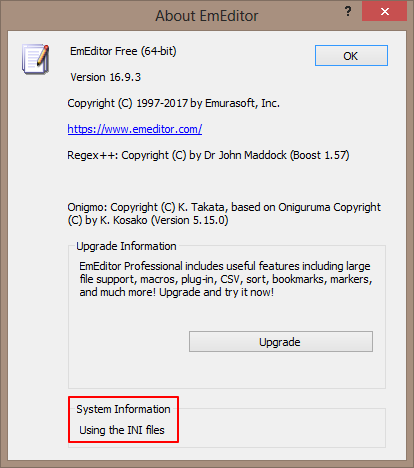 However, this free version does not include many features that EmEditor Professional offers, such as very large file support, plug-ins, macros, etc. 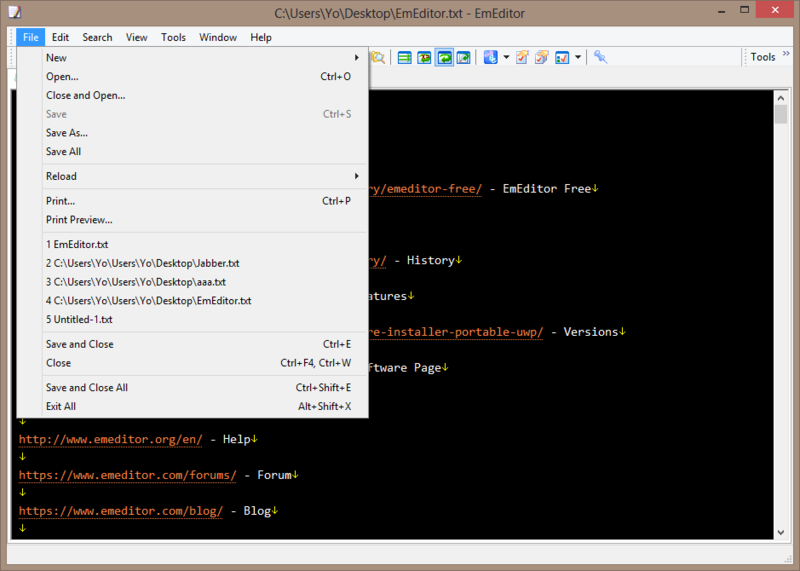 Starting with v13, EmEditor Free and EmEditor Professional use the same binary program. Running a single command switches Professional to Free, and vice versa. However, the Free version is available only for personal use. Once you downgrade the product to EmEditor Free, you will never be asked to upgrade or get any marketing messages, so please go ahead and keep it as the free version as long as you would like! Go to Tools and choose All Commands. Select Help and then Downgrade. 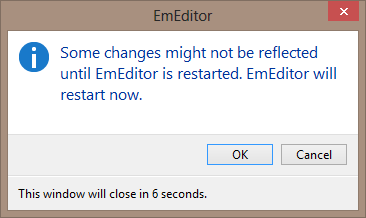 After restart EmEditor is downgraded. 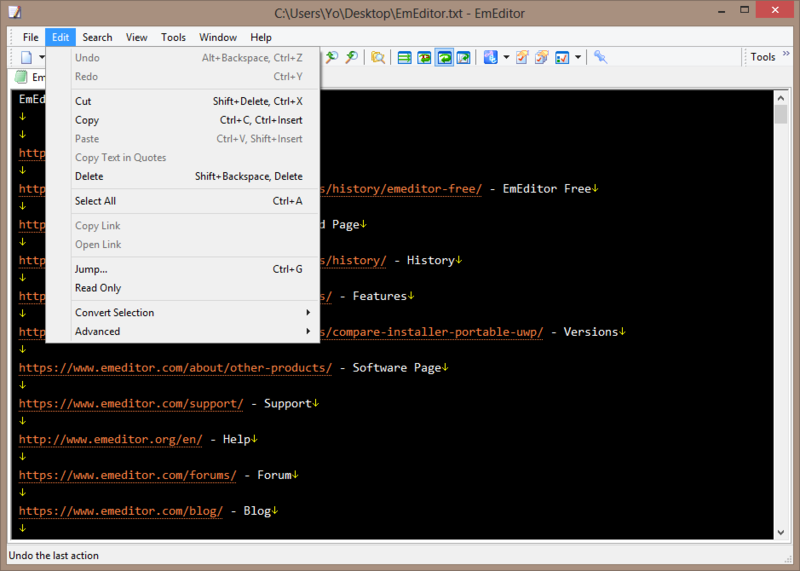 EmEditor has both x32 and x64 portable versions. EmEditor seems to be stealth. Download either x32 or x64 archive. 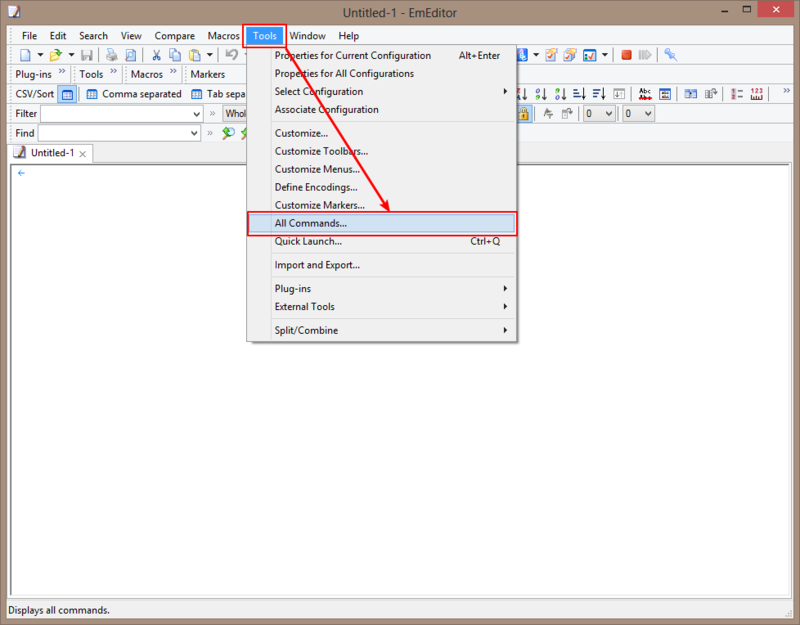 Settings are saved inside program folder. 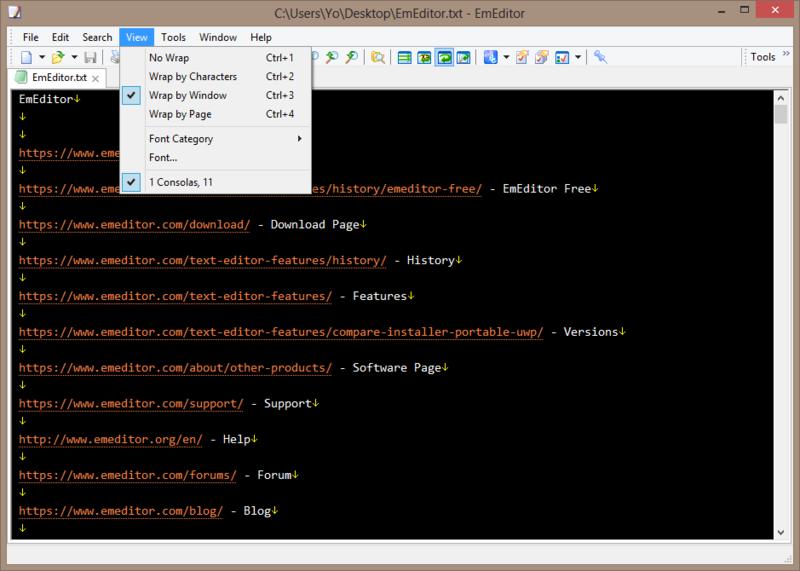 EmEditor supports all Windows versions from Vista to 10. 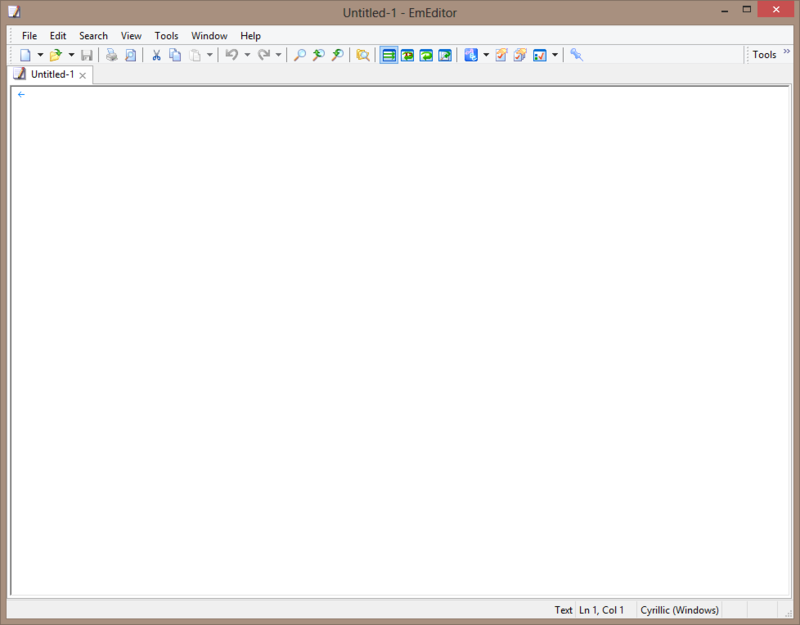 EmEditor Free is available for personal use only. 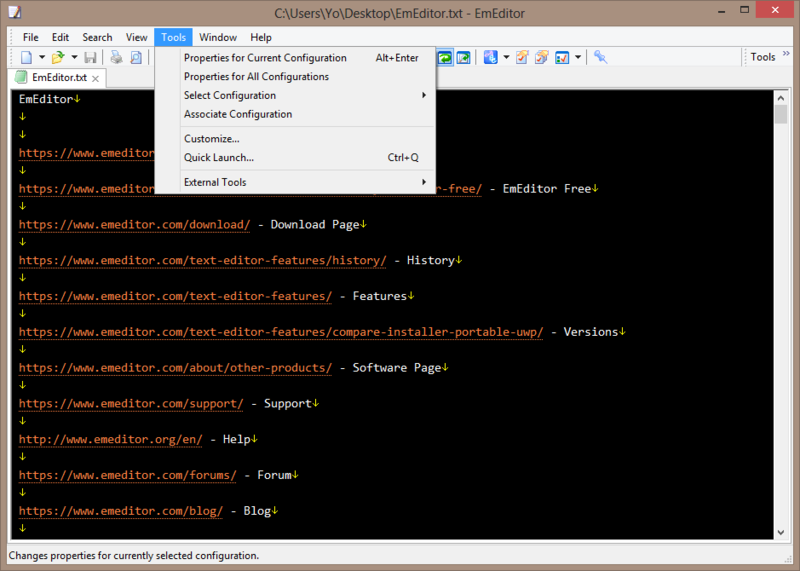 For me EmEditor Free is very limited, even full screen is not available in the free version. 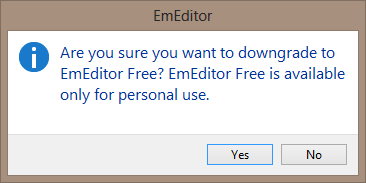 I have read that EmEditor Free is very good at editing very large files but I don't have such files, I have not tested it with huge files and therefore I cannot confirm. 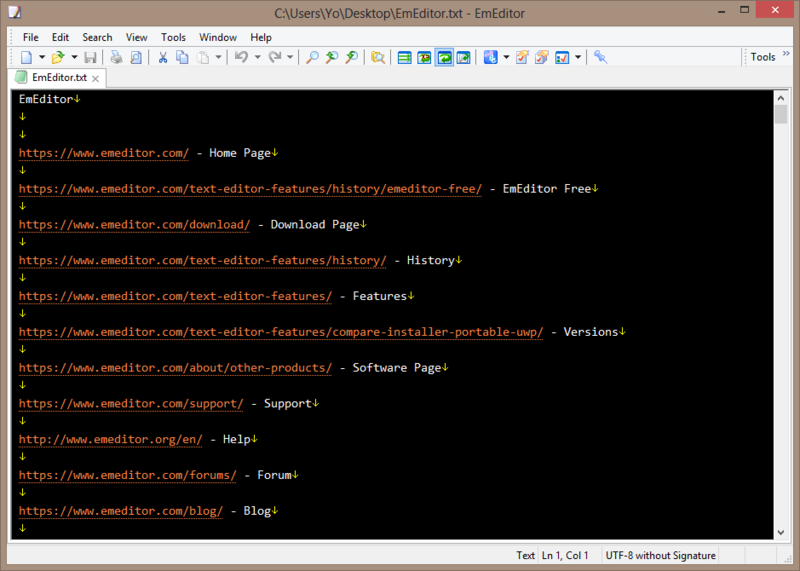 I suppose that TP109 might be interested to test EmEditor Free and include it in his Text Editor Performance Tests. 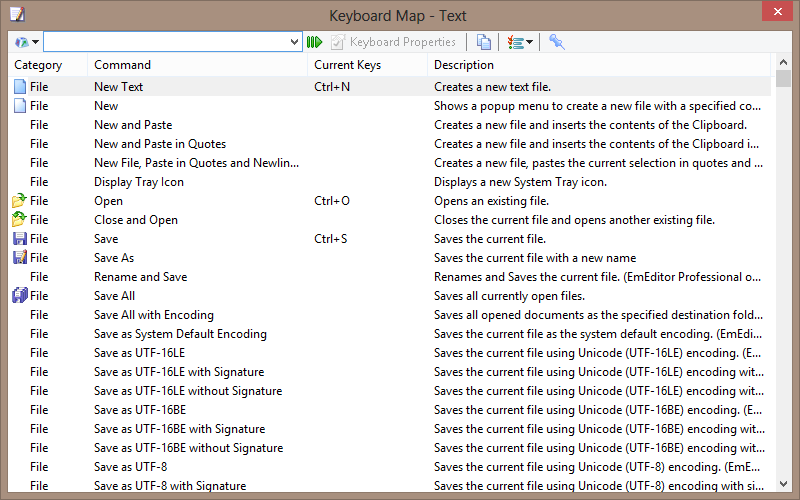 File details for EmEditor version 16.9.3 (released on 2017-06-15). Last edited by smaragdus on Sat Jun 17, 2017 9:24 pm, edited 4 times in total. I'm a little bummed it won't do something as basic as a Find-Replace, but I can see some of it's other features making it worth the effort. Thanks for the downgrade instructions. 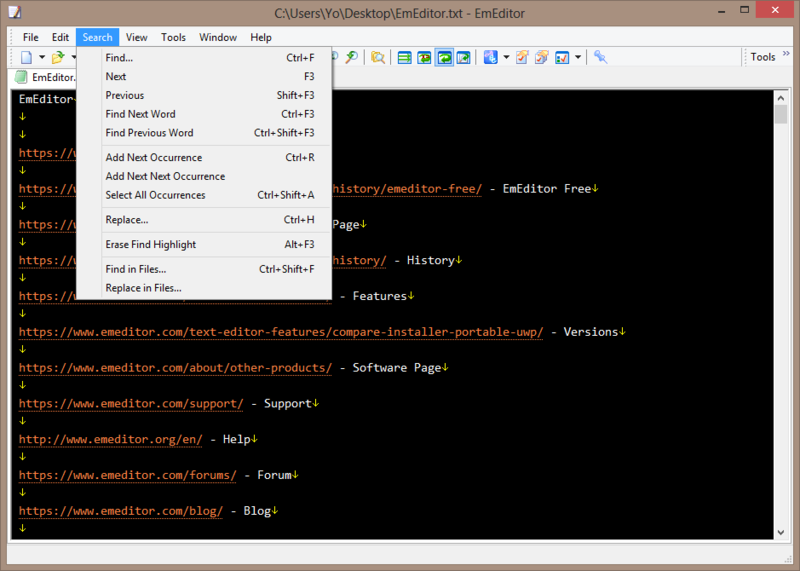 In fact EmEditor Free has Find/Replace- see screen-shot "EmEditor - search", it is mentioned in the Features section as well. smaragdus wrote: ... it is mentioned in the Features section as well. Oh Find and replace in files is paid version only. Missed that. I have been using this program for many years, since v.5.00.1. Absolutely the best program by all criteria, at least for my needs. The database entry for EmEditor Free mistakenly claims that EmEditor was included in the Text Editor Performance tests and "beat a variety of other text editors." That is an error that should be corrected. TP109 wrote: ↑ The database entry for EmEditor Free mistakenly claims that EmEditor was included in the Text Editor Performance tests and "beat a variety of other text editors." That is an error that should be corrected. I used to use EmEditor years ago, I even got the paid version. The problem with it is it truncates the paths in the recent files list. Did they make this optional? I contacted the developer several times years ago, but it never got changed so in the end I dumped the software. It`s a problem for me because the recent files list would show like 30 files, but the paths would all be the same, even though they were different files. So, I never knew which file I was opening. Why it`s truncated I have no idea, it`s stupid. I took a quick look at this again recently, but it`s still truncating the paths and I can`t see anything in the settings to disable it, unless I missed it? That's 100% my fault. Sorry about that.